No matter how busy I am (and December is always busy for me!) I can’t refuse a good drawing challenge. I rested a bit after Inktober and now I’m making a new Christmas/winter drawing each day with the unbridled enthusiasm of an Xmas outsider (mostly Jewish family, mostly Christian friends growing up). So if you’re not following me on Twitter yet, check back here for new drawings & sketches. They will probably get more and more frenzied before the big day! **Update 12/26** #illo_advent is over, and now I have a lot of new greeting card designs to develop for next year’s holidays! We always called it “The Night of Mischief.” I did the pencils and inks for this illustration on Oct. 30 during Inktober. 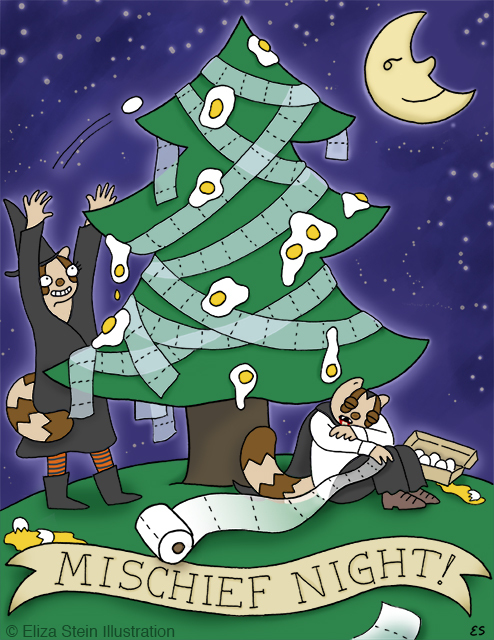 That day has long passed, but there’s no law that says you can’t decorate your Christmas tree with eggs, TP, and shaving cream for that devilish, juvenile delinquent spirit.